If gaining body fat triggers T2DM, is is not surprising that losing it, cures it. From the SuppVersity Facebook News you will remember that studies have shown that type II diabetes can be send into remission with "nothing" but a very low energy diet (Steven. 2015). The question scientists still had to answer, though, was whether the astonishing improvements in glycemia and overall health could be maintained on an energy-sufficient diet. In a newstudy from the Newcastle University scientists did now try to confirm just that by combining an 8-week dieting phase with a stepped return to isocaloric diet based on a structured, individualized (isocaloric) program of weight maintenance. Spread or waste your protein? 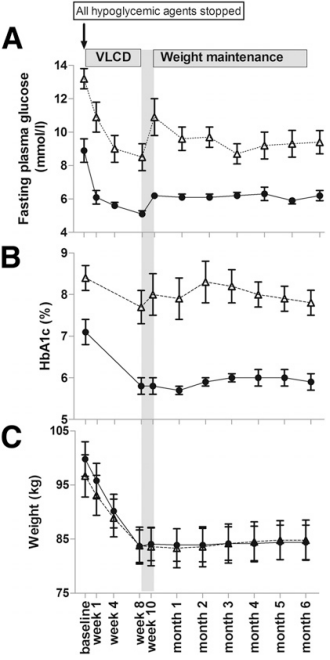 Glucose control, insulin sensitivity, insulin secretion, and hepatic and pancreas fat content were quantified at baseline, after return to isocaloric diet, and after 6 months to permit the primary comparison of change between post–weight loss and 6 months in responders. Table 1: Fasting anthropometric and metabolic data in responders and nonresponders at baseline, after VLCD and return to isocaloric eating, and after the 6-month weight maintenance period (Steven. 2016). To qualify as "responder" and thus patient who successfully reversed his diabetes, the subjects, thirty individuals with T2DM who had been suffering from T2DM for either either short- (<4 years) or long (<8 years)-duration, had to achieve a fasting blood glucose <7 mmol/L - and that not just after the initial 6 weeks, but after return to isocaloric diet. Figure 1: The weight loss speaks in favor of the efficacy of the diet intervention in both groups; filled responders, open circles non-responders (Steven. 2016). What did the diet look like? The VLCD consisted of a liquid diet formula (43% carbohydrate, 34% protein, and 19.5% fat; 2.6 MJ/day [624 kcal/day]; OPTIFAST; Nestle Nutrition, Croydon, U.K.) taken as three shakes per day. In addition, up to 240 g of nonstarchy vegetables was consumed, making total energy intake 624–700 kcal/day. Participants were encouraged to drink at least 2 L of calorie-free beverages per day and to maintain their habitual level of physical activity. To maximize adherence, one-to-one support was provided weekly by telephone, e-mail, text message, or face-to-face contact (S.S.). During stepped food reintroduction, shakes were gradually replaced by solid food over 7 days; with one meal replacing a shake every 3 days. Isocaloric intake was determined from resting energy expenditure measured by indirect calorimetry using an open circuit calorimeter (Quark RMR; COSMED, Rome, Italy) and a canopy hood and ended up ~1/3 below their previous obesogenic food intake - no wonder that they got diabetic before at an energy intake that was ~30% above what they'd needed to stay in a healthy body fat range. 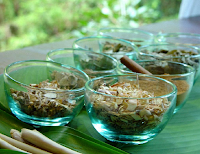 Physical activity was encouraged, but food behaviors were the priority. The responders were also younger (52.0 +/- 2.9 vs. 59.9 +/- 2.1 years, P = 0.032) than nonresponders (n = 17 [7 males, 10 females]). Responders were more likely to suffer from diabetes for a short(er) duration (9 of 15 of the short-duration and 3 of 14 of the long-duration groups). 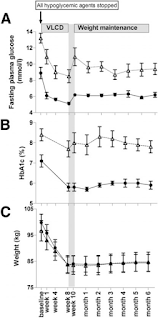 At baseline, responders had lower fasting glucose (8.9 +/- 0.7 vs. 13.2 6 0.6 mmol/L, P < 0.001) and HbA1c (7.1 +/- 0.3 vs. 8.4 6 0.3% [55 +/- 4 vs. 68 +/- 3 mmol/mol], P = 0.01). In addition, the responders had a lower total fat mass than the nonresponders at baseline (P = 0.04) (see Table 1) and didn't try as many (failed) treatment options, such as diet control (five vs. two); metformin only (six vs. four); metformin and sulfo nylurea (one vs. seven); metformin, sulfonylurea, and insulin (zero vs. two); metformin, sulfonylurea, and thiazolidi nedione (zero vs. one); and insulin only (zero vs. one), as the nonresponders did before participating in the study at hand. Diabetes can be cured by dieting down below your personal fat threshold! A previous study led by Professor Roy Taylor from 2011, who commented on the study at hand in press release stating that "[t]he study also answered the question that people often ask me - if I lose the weight and keep the weight off, will I stay free of diabetes?" and answering his own question as follows: "The simple answer is yes!" In the same press release from the Newcastle University, Taylor highlights that the results of the study at hand "supports our theory of a Personal Fat Threshold. If a person gains more weight than they personally can tolerate, then diabetes is triggered, but if they then lose that amount of weight then they go back to normal" and adds "[t]he bottom line is that if a person really wants to get rid of their T2DM, they can lose weight, keep it off and return to normal." Warning: Beware of high dose GABA (>3g) supplementation on empty! Those 100mg of GABA are very unlikely to have any negative effects on your health. With higher amounts, on the other hand, specifically if they are taken on empty and thus rapidly absorbed, side effect can occur. Anxiety, slowed breathing, weakness, they all are probably caused by peripheral effects (not in the brain), but this does not make them desirable, either. So practically speaking this means that you best stick to low / divided doses and if you take more, take it with food. It is important to point out that the study at hand is part of a growing body of evidence showing that people with Type 2 diabetes who successfully lose weight can reverse their condition (Lim. 211; Steven. 2015)- probably because the fat loss correlates with a reduced fat deposition and increased function in / of the pancreas. Figure 2: While there were no sign. 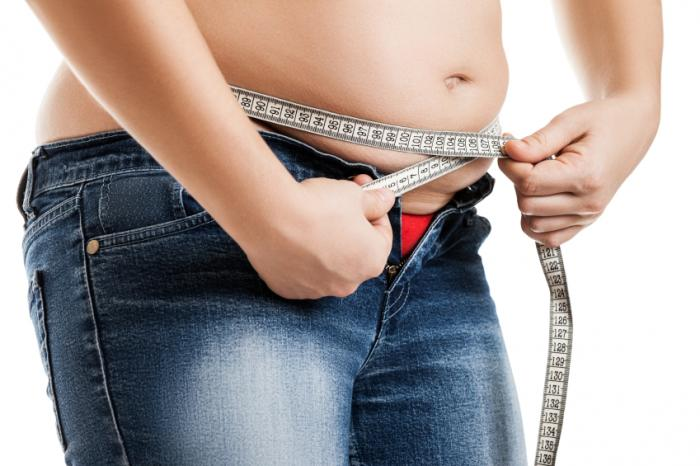 differences in weight loss, there were other antropometric and related differences between the two groups: BMI, body fat %, triglycrides and the insulin resistance of the liver (Stevens. 2016). says; and still, I am pretty sure that, just like Tutty who says that, "with [his] diabetes in remission, I haven't looked back", those who are able and willing to follow Tutty's example won't look back either. The elevated liver enzymes observed in the study point, once again, to the liver - Learn how to help your liver manage your glucose metabolism in this SuppVersity Classic. Dieting is a diabetes cure, but one that does not work for everyone - yet? While it is not clear whether a longer weight-loss phase that would have brought the non-responders to similarly low bodyfat percentages as the responders wouldn't have changed the results, we have to be honest: losing weight is easy, but eating 30% less than before, because that's all you need w/ your now normal weight is difficult... too difficult for many, probably. With that being said, it should be obvious that further research is necessary to determine the factors that distinguish responders from non-responders and whether the latter simply failed to pass their "personal fat threshold" as Professor Taylor's remarks suggest | Comment! Lim, Ee Lin, et al. "Reversal of type 2 diabetes: normalisation of beta cell function in association with decreased pancreas and liver triacylglycerol." Diabetologia 54.10 (2011): 2506-2514. Steven, S., and R. Taylor. "Restoring normoglycaemia by use of a very low calorie diet in long‐and short‐duration Type 2 diabetes." 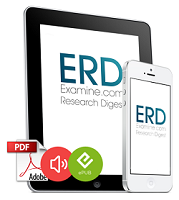 Diabetic Medicine 32.9 (2015): 1149-1155. Steven, et al. "Very-Low-Calorie Diet and 6 Months of Weight Stability in Type 2 Diabetes: Pathophysiologic Changes in Responders and Nonresponders." Diabetes Care (2016) Accepted Article. Wood, G. Craig, et al. "Preoperative use of incretins is associated with increased diabetes remission after RYGB surgery among patients taking insulin: A retrospective cohort analysis." Annals of surgery 261.1 (2015): 125-128.